This page has the technical details and manuals for the File System products. The main website's File System page has more info as well. 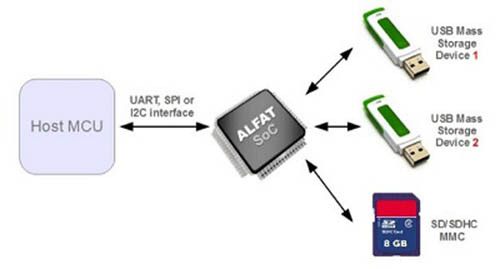 This kit offers everything needed to evaluate F40 (ALFAT) and the different ALFAT OEM boards. 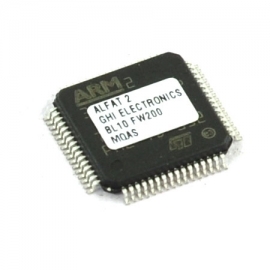 As F40 and F20 share the same command set, this kit can also be used for understanding the F20 commands. F40, originally called ALFAT, is the flagship file system chipset. F40 chipset with SD and dual-USB connectors. The PHY needed for USB 2.0 480 MHz speeds is available on one of the USB ports. 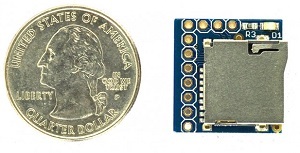 F40 chipset with SD connector. 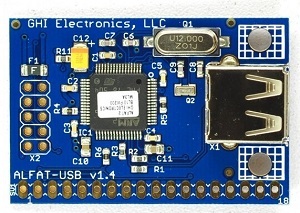 F40 chipset with USB connector. 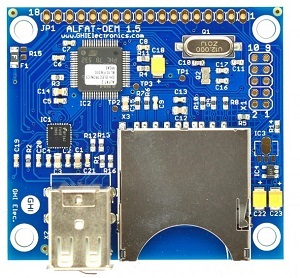 This board wires the F40 in SD-reader mode. 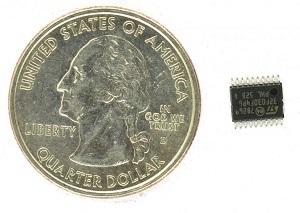 This low-cost chipset is compatible with F40 but with a limited feature set. 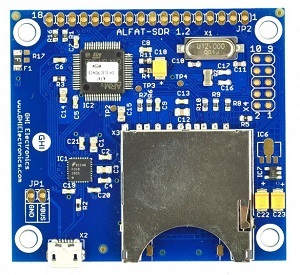 This boards combines F20 with a micro SD card connector on a very tiny circuit. It is possible to upgrade and downgrade the firmware on the file system chipsets using the built in GHI Bootloader v1. The product datasheets explain how to enter the bootloader. The GHI Bootloader page details how to use it. This is a legacy product, replaced by F40. 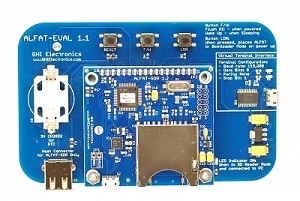 This product and its firmware and libraries are licensed royalty-free for commercial and noncommercial use. None of the provided documentation/schematics/libraries/sources are to be used in any manner outside for the benefit of implementing and using this product into your design. 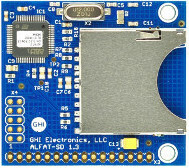 IN NO EVENT SHALL GHI ELECTRONICS, LLC BE LIABLE FOR ANY DIRECT, INDIRECT, INCIDENTAL, SPECIAL, EXEMPLARY, OR CONSEQUENTIAL DAMAGES (INCLUDING, BUT NOT LIMITED TO, PROCUREMENT OF SUBSTITUTE GOODS OR SERVICES; LOSS OF USE, DATA, OR PROFITS; OR BUSINESS INTERRUPTION) HOWEVER CAUSED AND ON ANY THEORY OF LIABILITY, WHETHER IN CONTRACT, STRICT LIABILITY, OR TORT (INCLUDING NEGLIGENCE OR OTHERWISE) ARISING IN ANY WAY OUT OF THE USE OF THIS PRODUCT, EVEN IF ADVISED OF THE POSSIBILITY OF SUCH DAMAGE. GHI ELECTRONICS, LLC LINE OF PRODUCTS ARE NOT DESIGNED FOR LIFE SUPPORT APPLICATIONS. SPECIFICATIONS, PRICE AND AVAILABILITY ARE SUBJECT TO CHANGE WITHOUT ANY NOTICE.